Sinclair Broadcast Group “just tightened its grip” on local TV, said Sydney Ember and Michael de la Merced in The New York Times. “Already the largest owner of local television stations” in the U.S., Sinclair announced this week that it is buying Tribune Media for $3.9 billion, beating out bidders like 21st Century Fox. 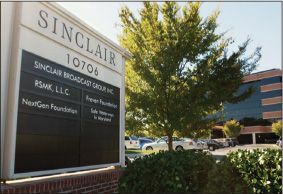 The deal will allow Sinclair to reach more than 70 percent of American households by adding to its portfolio Tribune’s 42 stations, “many of which are in larger markets” like New York and Chicago. Some analysts have speculated that Sinclair, which “has shown a willingness to use its 173 stations to advance a conservative-leaning agenda,” may be working to set itself up as a rival to Fox News. Sinclair has “long been an influential force for Republican politicians and political candidates,” said Dylan Byers in CNN.com. Now, it’s set to grow even more powerful, thanks in large part to President Trump’s newly appointed chairman of the Federal Communications Commission, Ajit Pai. The FCC officially caps broadcasters’ total household reach at 39 percent, which has effectively barred Sinclair from acquisitions. But the agency recently moved to make it easier for broadcasters to understate their overall reach, clearing the way for Sinclair’s megamerger. “Coach’s deal to buy Kate Spade is finally in the bag,” said Phil Wahba in Fortune.com. Following months of speculation, the affordable luxury retailer confirmed this week that it’s acquiring Kate Spade for $2.4 billion in cash in a bid to win over younger customers and expand its brand portfolio. Coach has been “enjoying something of a comeback after years of aggressive discounting and expansion hurt its luxury aura in North America.” The company plans to employ at Kate Spade many of the same strategies it used to repair its own business, like having fewer sales and leaving low-performing department stores. Congressional Republicans have taken a big step toward rolling back Obama-era financial regulations, said Rac hel Witkowski in The Wall Street Journal. The House Financial Services Committee voted along party lines last week to send a bill undoing “significant parts” of the 2010 Dodd-Frank law to the full House of Representatives, “where it likely will be approved in the coming weeks.” Among other things, the Financial Choice Act would ease many banking regulations and greatly weaken the Consumer Financial Protection Bureau. But the bill “faces uncertain prospects” in the Senate, where it will need Democratic votes.